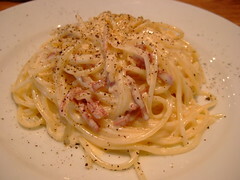 A small Italian near Jimbocho station. Absolutely love the lunch here. 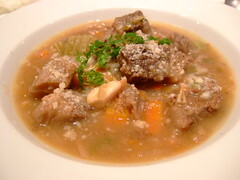 You can choose from two types of pasta and one stewed meat dish served with rice. The menu changes everyweek so I end up coming back here 2-3 times a week just to try everything because they all sound so tempting. 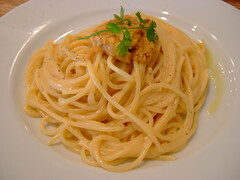 The quality here is fantastic – actually I think it’s the best pasta lunch place in the area, but it’s slow because one chef is cooking everything and the restaurant is always packed with OLs and salarymen. Sometimes the wait could be as long as half an hour…and the counter seat around the open kitchen isn’t exactly the most comfortable place to sit for that long especially when you are hungry. Despite of the frustration of waiting, I always come back because the food is just too good. 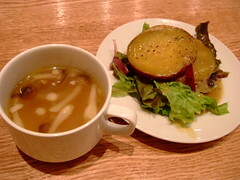 The appetizer and the soup in the picture above come with lunch, and they are always the same – onion and mushroom soup, and sweet potato salad. 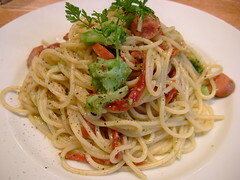 While they are not bad, I am so so so tired of its taste after being served it so many times – I guess no one goes back to the same lunch spot so many times like I do(^^;;;). 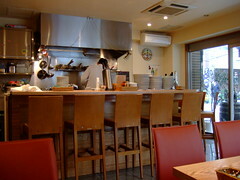 And for those who know about Japanese food critics…I actually saw Kurusu Kei eating there once at lunch time. 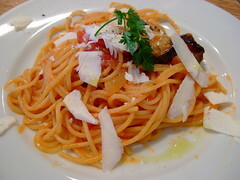 I searched for his homepage(here) and checked if he has any recommendations for this area, found him blogging about another Italian restaurant near Ogawamachi station. 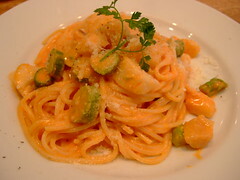 I visited it a few times…and didn’t like the food there(^^;;). Fried aubergine and Ricotta Salata, Norman style, Y900. 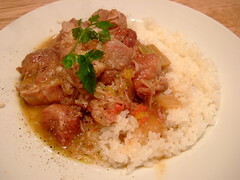 Stewed pork and paprika, served with rice, Y1000. 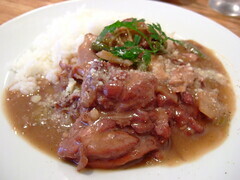 Pork shoulder loin cooked with sour plum wine and vinegar, Y1000. Kajiki Maguro(swordfish) and summer aubergine sauce, Y900. 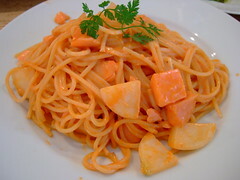 Fresh sea urchin spaghetti, Y900. 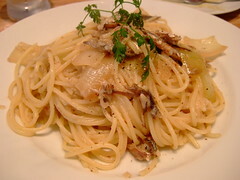 Sardine and onion and breadcrumbs, Y900. Salmon and summer turnip, tomato cream, Y900. Pork belly and white bean, basil flavour, Y900. 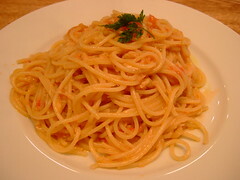 Zuwai-gani(crab) and crab miso, fresh tomato spaghetti, Y900. 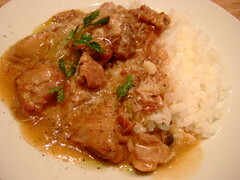 Chicken cooked in red wine, Y1000. 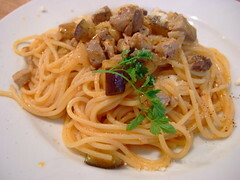 Maguro tail and aubergine Ragu pasta, Y900. Scallop and asparagus, Aurora sauce, Y900. 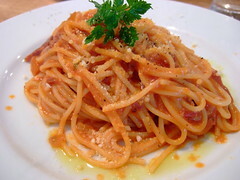 Amatriciana – spaghetti cooked with prosciutto, onion, Amaretto. Pepperonchino with Iwanori seaweed and scallop. 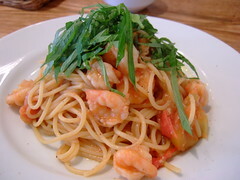 Prawn, Ooba(green shiso), fresh tomato. 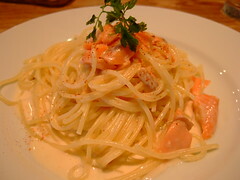 Salmon, lemon flavoured cream spaghetti. 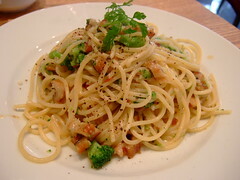 Chopped anago, broccoli, Ragu pasta. Pepperonchino with small prawn and white beans. 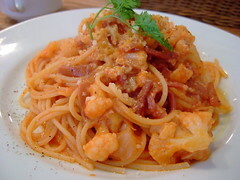 Prosciutto and cauliflower, tomato sauce. 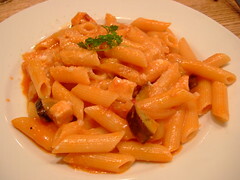 Kajiki Maguro, aubergine, Penne Arrabbiata. 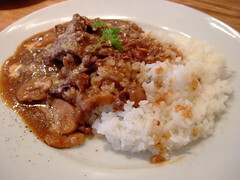 Menu(J): 1, 2, 3, 4, 5, 6, 7, 8, 9, 10, 11, 12, 13, 14, 15, 16, 17, 18, 19. 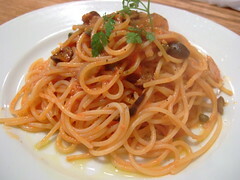 This entry was posted in 02:Italian, 08:神田・神保町・秋葉原, Favourite Food Entries, Good Cheap Eats by seat. Bookmark the permalink. I missed your reviews and gorgeous pictures! Everything looks SO yummy. 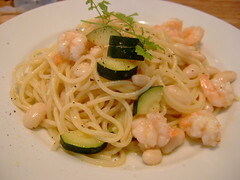 I have to say pasta in Japanese is probably better than anywhere outside Italy. 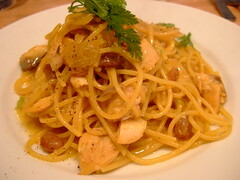 Yes pasta is one thing I will miss. 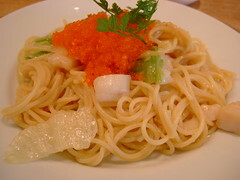 The Japanese understand “al dente”(maybe because they have similar concept for udon – “koshi”. Haha.). 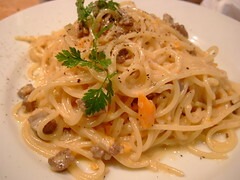 One Italian friend told me that for the same price, Japanese pasta is actually better than Italian ones. That guy is from Sicily! Haha it looks like you almost got a catalogue of their dishes! I do like places that change their menu all the time, it makes sense as they only cook what’s seasonal and what’s fresh. 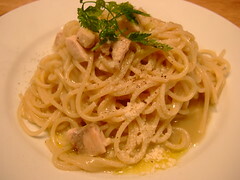 I’m going to copy and try to make some of these dishes hehe… sound delicious and not that hard to make! Thanks for the pics. I haven’t been in Japan for two years, and seeing all of this is a nice reminder. 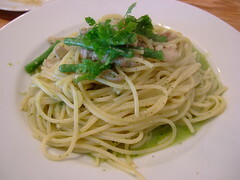 There are lots of Japanese spaghetti places here but they’re just not the same.